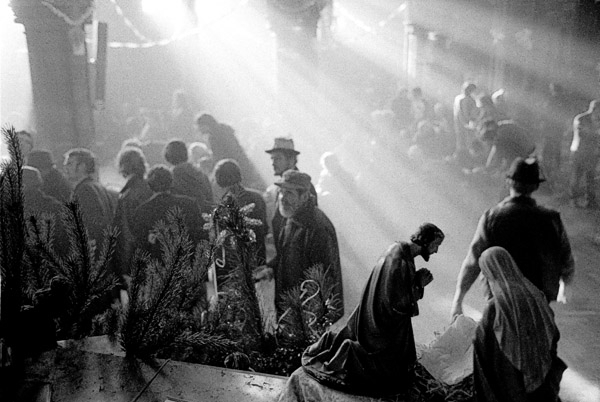 Almost by chance, at the end of the seventies, photographer David Hoffman found himself recording the formation of an organisation called Crisis at Christmas that opened up disused spaces and created temporary shelters staffed by volunteers to provide accommodation for the homeless through the holiday season when other shelters were shut. 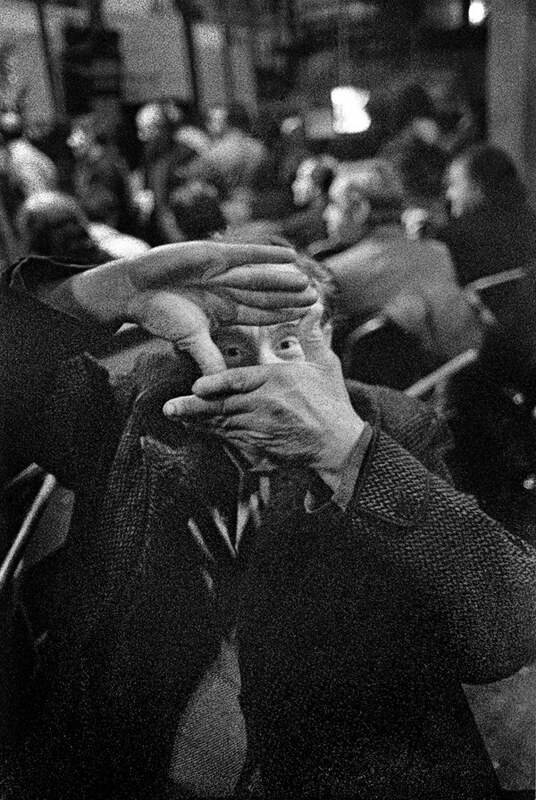 As a participant rather than a visitor, David was able to take intimate photographs of those who sought refuge, capturing emotional images which are compassionate yet void of sentimentality. 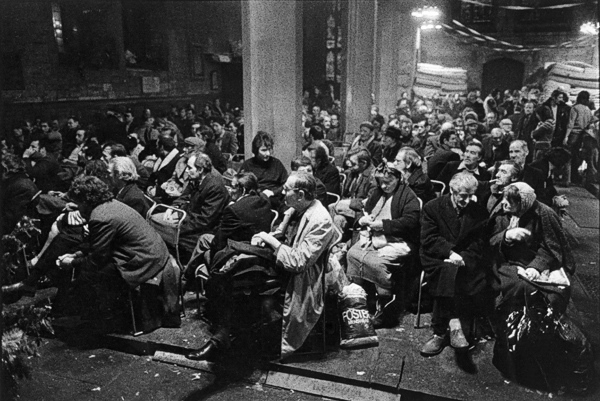 There is a timeless quality to many of these pictures that could equally be of refugees from a war zone or in some apocalyptic dystopian vision of the future, yet this is London in the recent past and Crisis at Christmas is still with us and the work goes on. 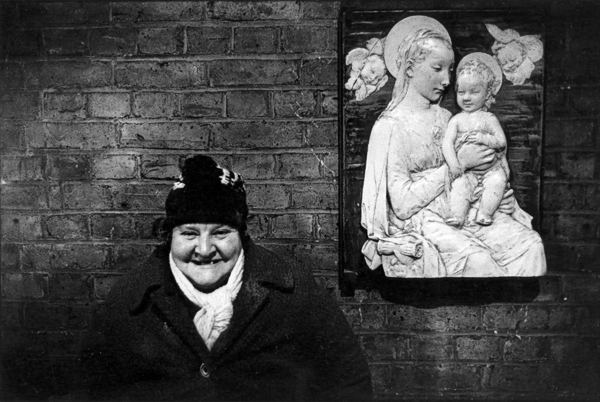 “At the time, I was known for my photos of the homeless at St Botolph’s in Aldgate and I was going out with a girl named Peta Watts, who was working at Crisis at Christmas – so when she asked me to take pictures there, I leapt at the chance of becoming the Crisis photographer, and I did it for three years. 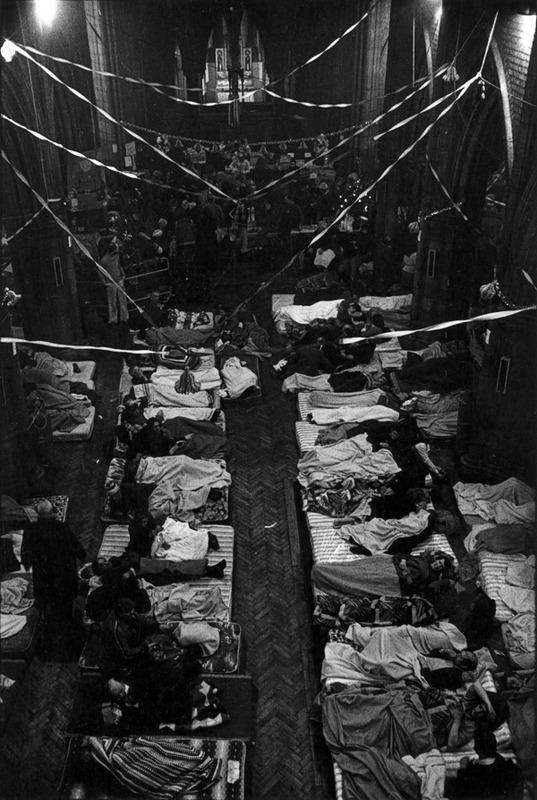 This was the early days of these shelters and they used derelict churches. One of them was St Philip & St Augustine in Whitechapel, round the corner from the squat where I lived in Fieldgate Mansions, and the next year it was at the Tradescant church of St Mary’s in Lambeth. So there were very little facilities – perhaps only a cold tap and one toilet for hundreds of people – and the whole thing was a chaotic feat of organisation, but somehow it all worked. They got donations of food and clothing and toys. And I remember some of the guys found an old bath tub in a skip and brought it in and filled it with water, so they could wash themselves. There was no regard to Health & Safety or regulation as we know it, but it all worked brilliantly and everyone was very well looked after. There was no hierarchy and the homeless people would be involved in the cooking and arranging the mattresses, and keeping the whole thing running. I photographed it because it was a wonderful event and – like at St Botolph’s – some of the people were couples, and I took their pictures and brought them prints the next day. 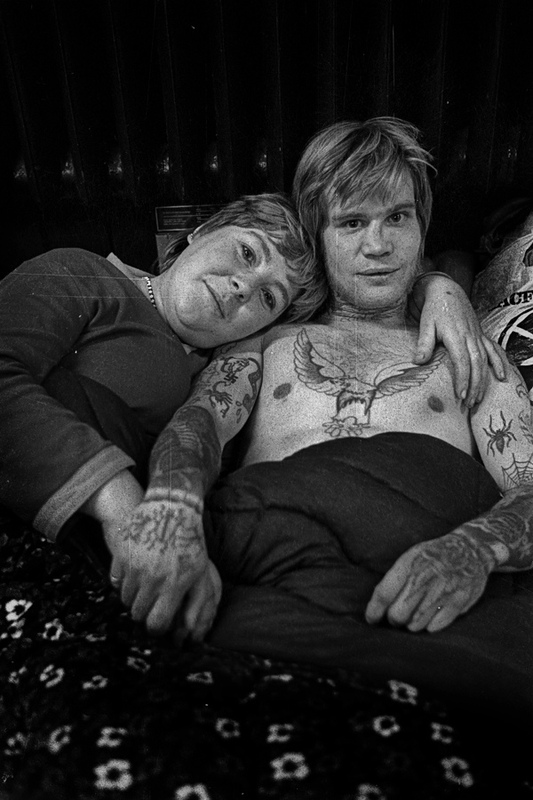 Many of these people had been living on the streets all year and the photographs helped them to have a more positive self-image. Emotional viewing. Taken me nearly two hours to write this as I knew many of the faces at Crisis and St Mary’s. David’s massively important archive is a historical gem… one of the multifarious ‘histories’ that are normally hidden from us. Truly shocking, thanks for reminding us of these often forgotten people. I have no doubt the same or very similar situations exist today. Some very moving photographs… Thank you for THEM at this time! Another fantastic example of Davids photography. David is still actively recording the troubles of the underprivileged from the actions of the powerfull. He has been assaulted, wrongly arrested, had his teeth knocked out and been harassed by the authorites. 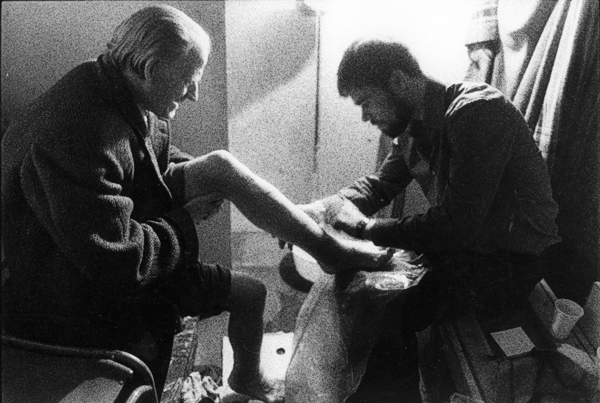 When the policeman whacked the legs of a woman a a recent demonstration David was there recording it. 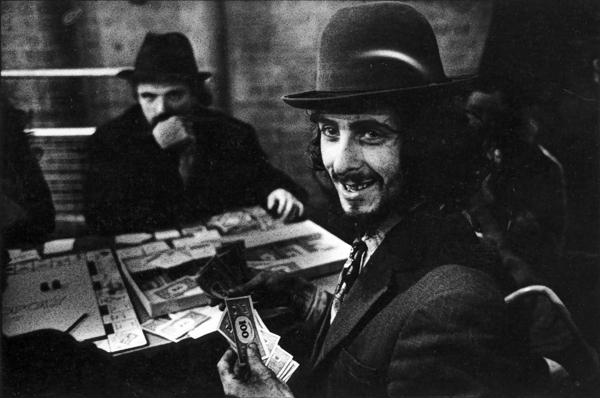 He soldiers on, he is not a wealthy man but is content with his lot and the Hoffman Photo Library will remain as a vital record of the times for many years to come. The fact that Crisis at Christmas still exists in the 21st century is a terrible inictment of our sodiety.As Chris F says why on earth are we doling out aid money to India,China & corrupt African states when there. Is still real want in our country.Politicians!! Powerful, frightening and deeply moving images. 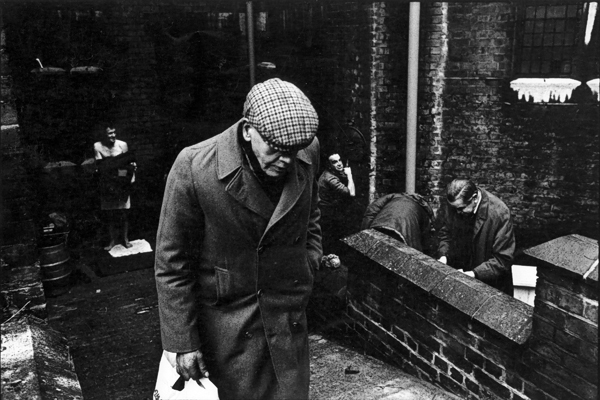 Following the collapse of my parents marriage in the 1970′s, my own father entered a downward spiral which eventually found him down and out and homeless on the streets of London. As a small boy I never really understood the reasons behind his departure and spent most of my young life hopefully anticipating his return and life becoming ‘normal’ once more. This feeling intensified particularily around christmas time as I mixed the wonder of ”Father Christmas’ and the anticipation of the impending magic with the hope that my dad would come home. I had a theory that he must be aware of the intensity with which I thought of him and missed him and that he would not leave his boy alone at this special time of year. On Christmas eve, as darkness fell, I would look out on the dark, empty streets and imagine seeing my dad walking down the path and all would be wonderful again in the world. 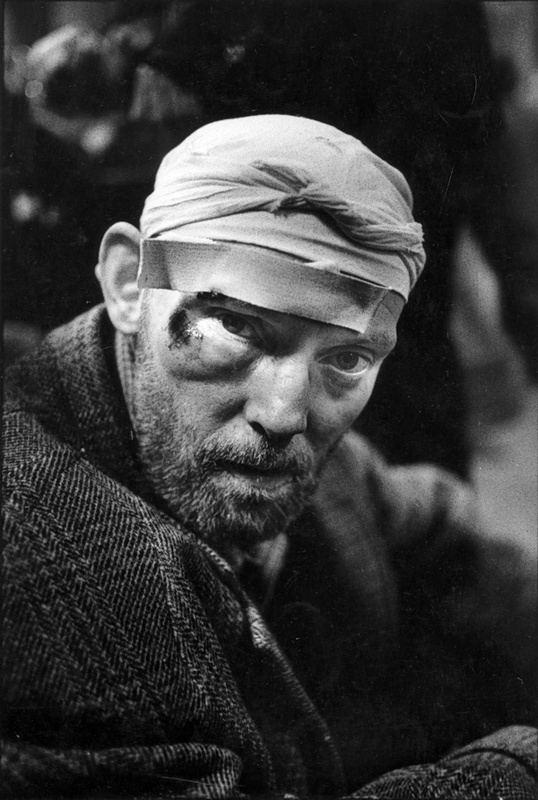 Having spent some time initially viewing these photographs with a mixture of shock, horror and sadness I found myself scanning the faces of the forlorn men in hope that I might indeed find my own father among them. Quite strange really, I am sitting here 40 years on with my own family in the buzz and warmth of pre-christmas activity and yet deep inside my heart is still looking down the path for the dad who never did come home. 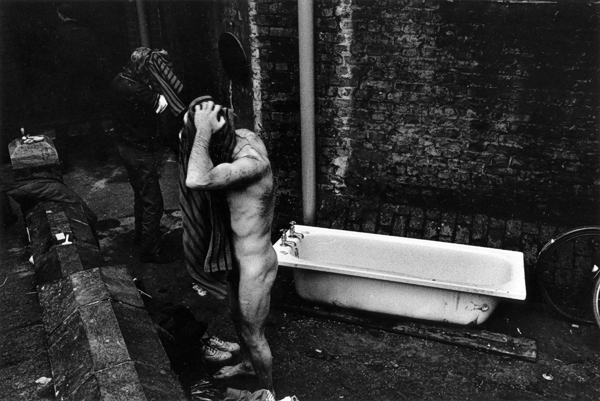 I’ve never seen David’s work previously and these photos are fascinating. 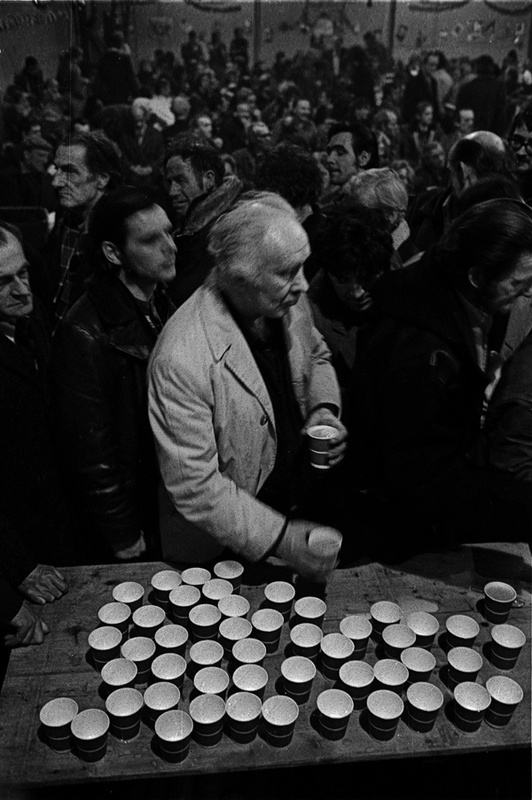 I’ve worked at Crisis at Christmas for a number of years in the past from my first experience on the Caledonian Road in the mid 90s which was a real baptism of fire as it was the drinkers’ shelter and then at various locations around the Capital. It never ceased to amaze me how appreciative the ‘guests’ were of what the volunteers did for them. The true spirit of Christmas. David did some important work in those days, this is some of his best. Wonderful photographs, incredibly moving, thank you David and Gentle Author. The comments are as heartrending as the photos! Shocking that this situation still exists today. Oh Lor’ … There, but for the grace of God … The sleeping arrangements was/is just miserable, horrendous. The photos are so hard to view. Crisis do such a great job. Nobody should be on their own at Christmas. We had a local trust here that did this every year, then the woman who ran it retired and it closed. I don’t know what will happen to all the people this year, so I gave money to the Salvation Army as I know they care. A CAVIAR – CHAMPAGNE – BLANKETS & FLEAS CHRISTMAS. 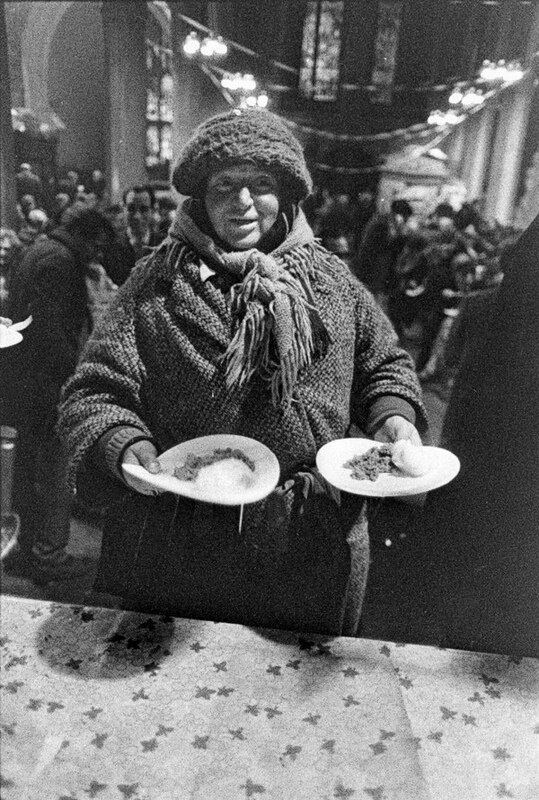 I helped organise the OPEN CHRISTMAS, a three-day fest of soup, mince pies, sausage rolls and blankets circa late 60’s early 70’s. Today, it is a very efficiently run ten-day seasonal event which highlights and responds to relieving the lonely Christmas conditions of homeless people; not only in London but in nationwide venues also. 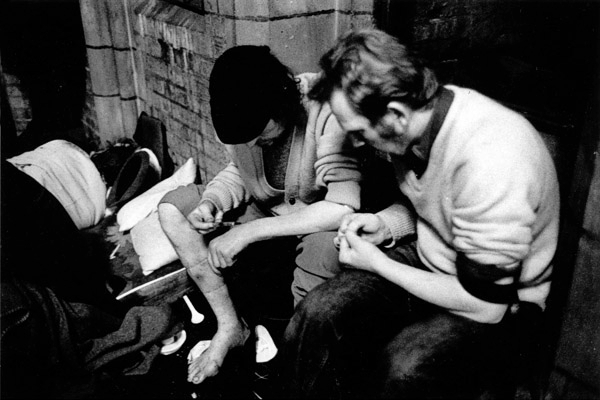 What was once a London ad hoc effort to provide basic food, clothing and warmth as a brief respite for people who slept rough is now a highly organised Charity – CRISIS – providing high standard food, baths, medical care, housing help and advice. The originators of this basic help initiative were formed of a small group of mainly key church movers and shakers in the London homelessness field who would meet in late September to plan what was then known as Crisis at Christmas. So it was that I was invited to join Rev. David Moore – Director Bow Methodist Mission & founder of CHAR (Campaign for Homeleess & Rootless); Richard Smith, Director No Fixed Abode – an umbrella group of homelessness agencies; Rev. Eugene Morse – East End Methodist Mission; Rev. 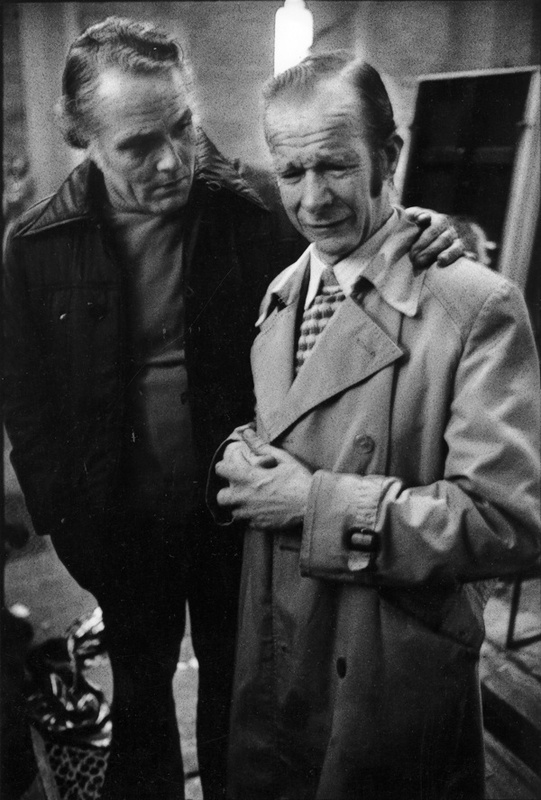 Malcolm Johnson, Vicar of St Botolph’s Church, Aldgate, and Church Army Captain Terry Drummond. A fellow layman, Pat Logan founder of UNLEASH * participated as consultant adviser. I qualified to be in this company being welfare Administrator of Providence (Row) Night Refuge & Home, 50 Crispin Street, Spitalfields. Quaker Action supporters and members of the Salvation Army and volunteer nurses from the main London Hospital Nursing Schools and the Metropolitan Police cadets were drafted in. Caspar Werley, a monk, was seconded from his monastery to command a team of lay volunteers and direct the whole operation. Caspar delegated various fund raising aspects to me and I was rostered for work on Christmas Eve in 1977. 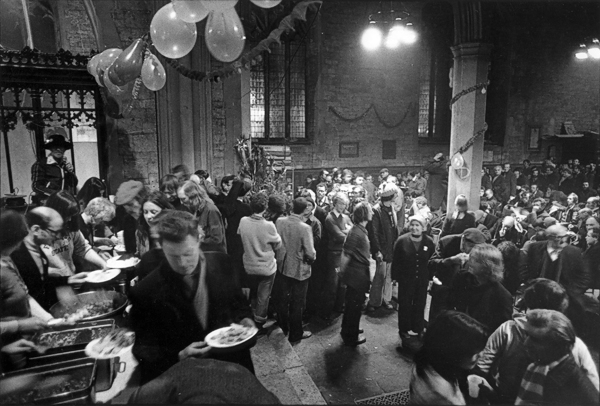 Miracles were performed over a number of months and Crisis at Christmas was ready to open in St. Mary’s Church – now The Tradescant Centre – next to Lambeth Palace. Long before the church doors opened, I passed a half-mile queue forming alongside the Palace and stretching down as far as St. Thomas’s Hospital and County Hall where Capital Radio had set up a temporary studio. I had been assigned to contribute to a broadcast about Crisis at Christmas with Jim Horne – charismatic founder of St. Mungos, Organiser of nightly Soup Runs and master of empty buildings acquisition as shelters for homeless people. The Director of CHAR – Campaign for Homeless and Rootless People – and tireless campaigner – Nicholas Beacock spoke also. The tailpiece of the discussion was the opportunity given to contributors to make a direct appeal specific to each represented charity. I appealed for footwear and clothing for Providence Row Night Refuge. Next day, tons of both requirements were delivered: a particularly unusual gift was hundreds of unused blue Metropolitan Police issue shirts – without collars. 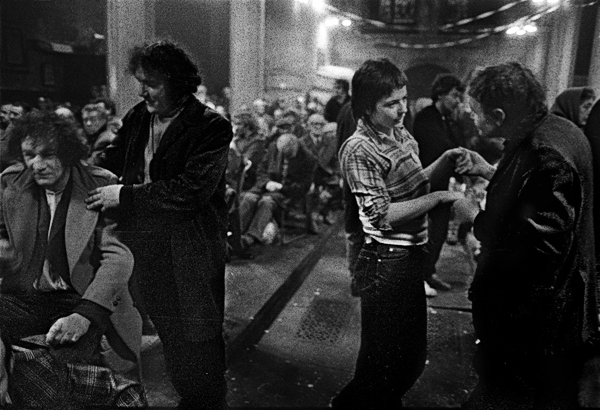 When I got to St. Mary’s later that night the pews were stacked ceiling high against the walls and the floor space packed with sheltering “dossers” – a politically incorrect word now – but that was what they called themselves then. Indeed, Ted Eagle founder of PROD – Protection of the Rights of Dossers – was a helper along with other co-workers, I attended Midnight Service celebrated at the raised holy end by Malcolm Johnson assisted by Caspar. 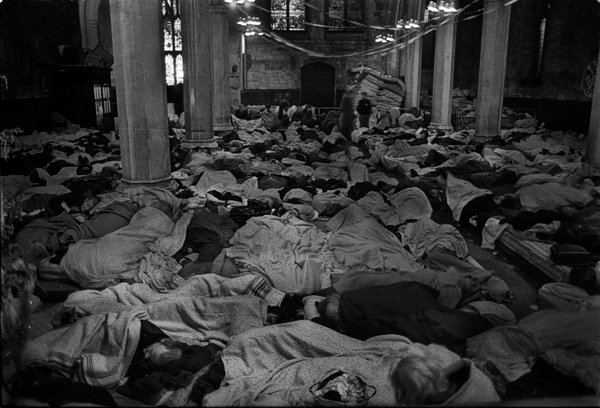 Down in the darkened well of the church hundreds of homeless people sprawled on mattresses watched over by mainly women workers. The glow from the fags being surreptitiously smoked winked back up at us as the service progressed. Just before the Collect, a man rose from his mattress: mounting the steps he then sat himself down on what would have been the Archbishop’s Chair and intoned the most perfect and appropriate latin. He remained there throughout and responded in latin as and when. Communion was taken in both kinds under the Anglican Rite. 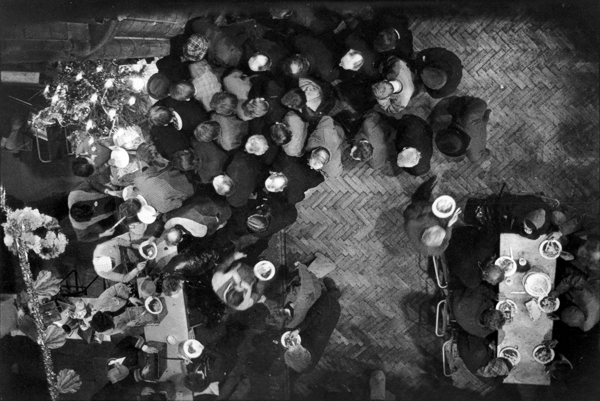 Later, about one thirty in the morning, as we crept past the sleeping “Congregation” to head home I heard a whispered: “Tony! Tony! Give us a fag!” In the gloom I recognised Laura a woman I, along with many others, had often helped out in the past. I bent down and gave her the remainder of a packet of Guards I had on me while extracting a promise that she would not smoke them until the morning. A dwarf, Laura stood on a sleeping figure cheek by jowl on the floor and, all stale drink fumes, hung suspended from my neck long enough to kiss me. Happy Christmas! Laura was a chronic alcoholic: when no palatable alcohol was available she drank the “Jake” methylated spirit cut with lemonade. A way of getting money was to allow herself to be thrown about – the ancient pastime of dwarf-tossing practised at one time in certain East End Pubs. Four years later, a policeman, an acquaintance, the Limehouse Coroner’s Officer in fact, told me that she had been murdered in a Wapping “derry” a derelict house. Her special friend was eventually successfully resettled. See “Helen Goes Home”. 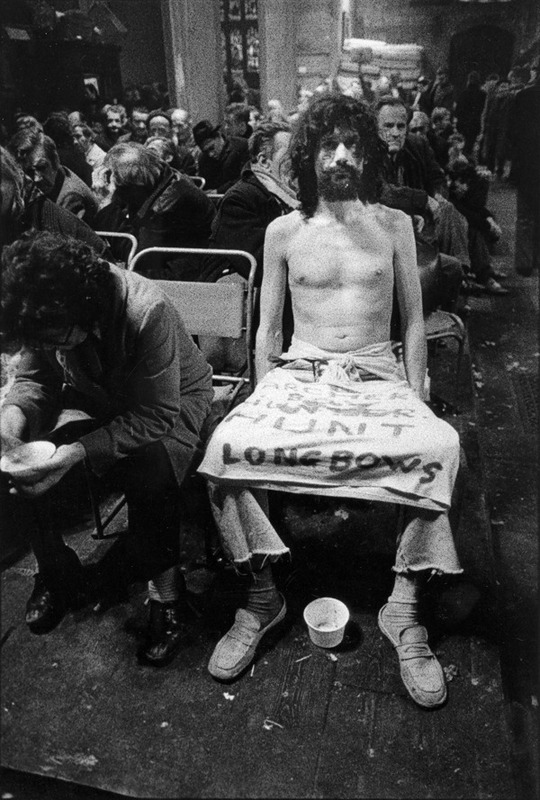 For many years I was very close to the street homeless of London’s East End. Indeed, I was so familiar with their ways and knew their real names: “Scouser” Bob, “Brummie” Dave, “Galway” Mick, “Scrumpy” Jock etc., usually sufficed among themselves. Others, murder squad detectives, used to visit me at Providence Row Night Refuge and ask me to help identify dead people. 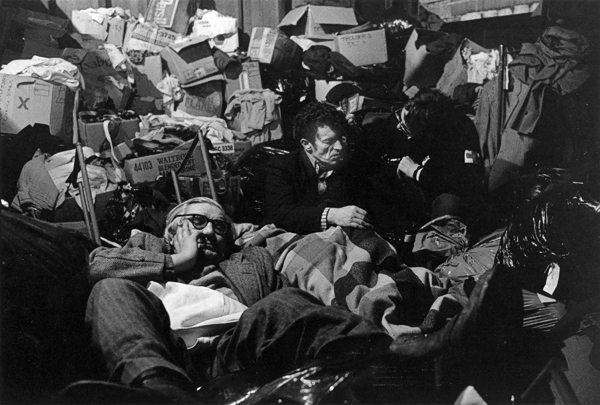 I would be driven to locations where the bodies would still be lying where they were found: in underground garages, tower block stairwells, chaotic squats, derelict houses, “skippers” i.e. any kind of makeshift shelter. Frozen, burned, battered, often choked when being sick in sleep, sometimes gnawed by rodents. More often or not, I would look down into their dead faces as they were slid out on metal trays from the refrigerator at Limehouse Mortuary and put a name to them. 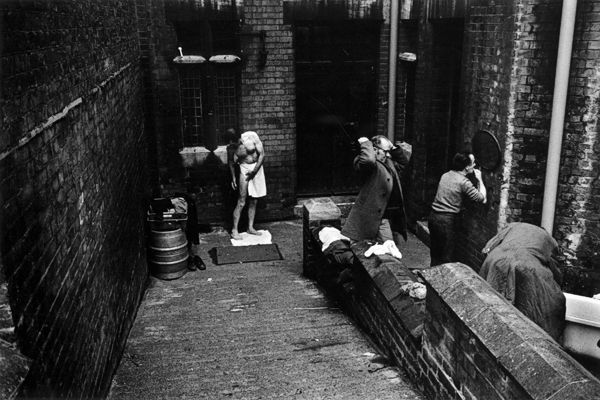 Few people knew that at Bethnal Green Police Station there was a unique photographic “Dossers Gallery”. 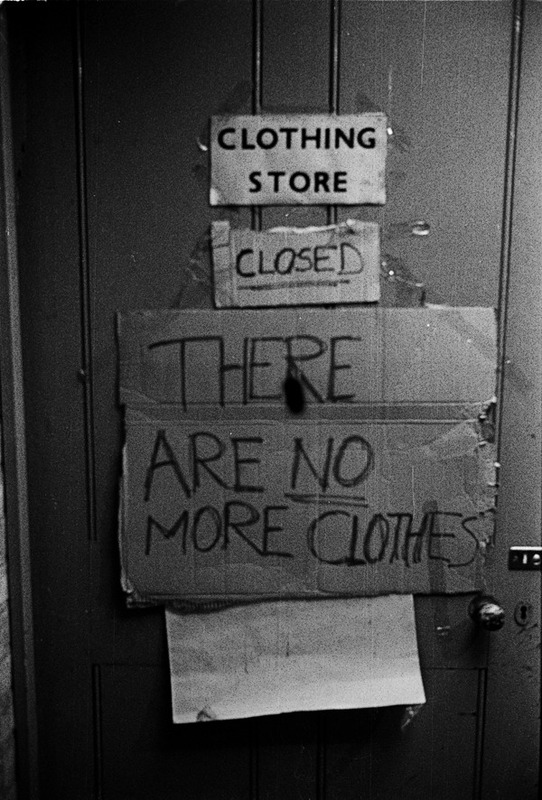 This consisted of a series of regularly updated photographs of homeless men and women sleeping rough in the neighbourhood: Aldgate, Spitalfields, Whitechapel, Shadwell & Wapping mainly. They were photographed in situ undisturbed as they slept. It saved a lot of precious police time. 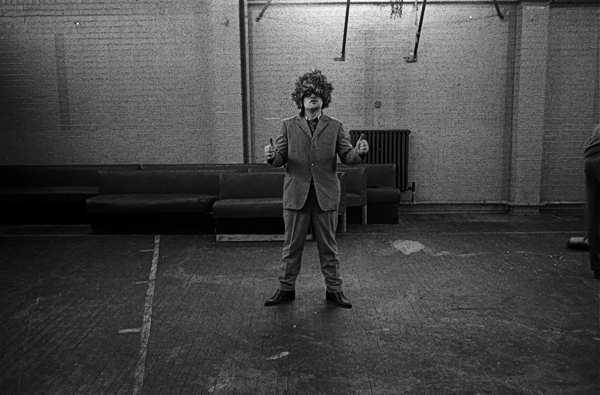 One of the few comforts gained from working with homeless people was their sense of humour; often ironic, some of the best jokes were those they told about themselves. This anecdote about Crisis at Christmas was told me by a homeless man. I had asked him what he would have liked for Christmas and he replied: “A school tie – Eton colours – Dear Boy! With two crossed cider bottles and the motto “Bibo ergo sum”. My narrator set the scene of his anecdote thus: Crisis at Christmas three-day Shelter is ending. 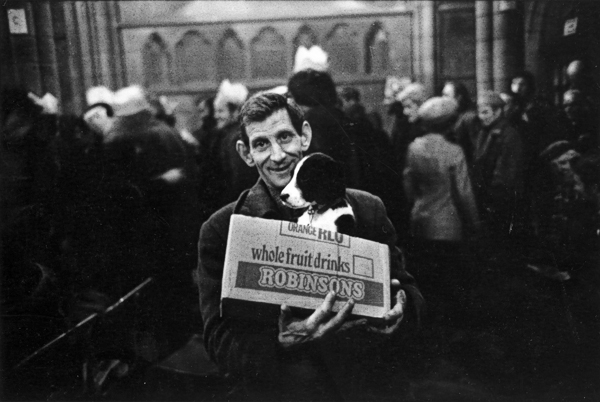 Hundreds of homeless people stream out to re-occupy the streets and whatever shelter is available: the worst off to avail of whatever minimal shelter they can find: Cardboard City:– packing cases at nearby Waterloo Station; Charing Station and under the bushes on nearby London Embankment or the DHSS controlled Camberwell Spike. 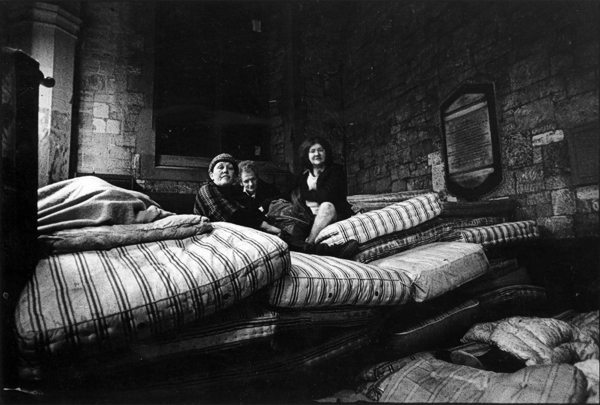 The ‘better off’ will move back into in the numerous doss-houses of up to a thousand beds that warehoused the homeless in those days. 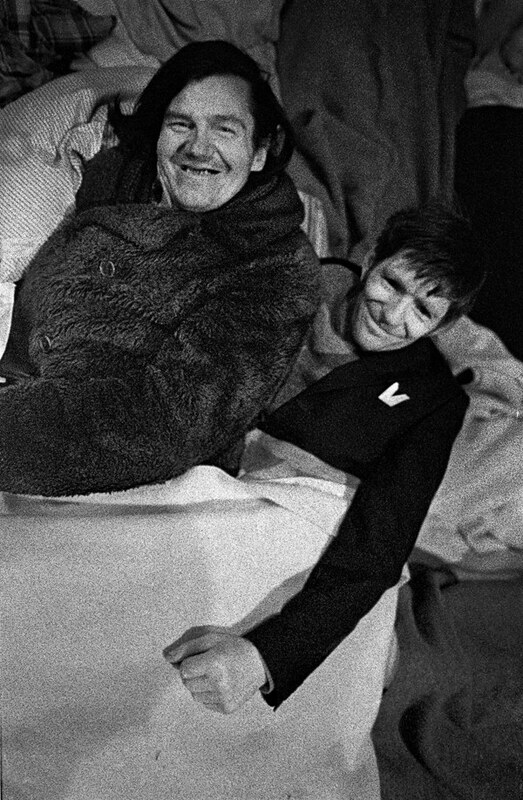 The ‘best off’ having spent a few days with old associates living “on the ramp” (No Fixed Abode) will return to bed-sitters where life, for many, is an often lonely resettled existence. On this number – usual hours”. The Attendant says “Another NFA! Can you say who it is? “Can I look at the clothes? “None found.” is the reply.